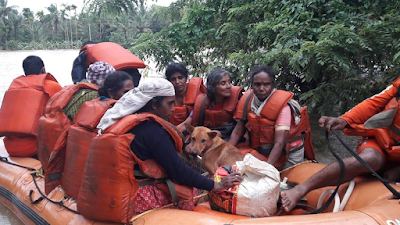 The Armed Forces, the National Disaster Response Force (NDRF), Central Armed Police Forces (CAPFs), Coast Guard, and stakeholder Ministries and Departments of the Central Government worked hand-in-hand to smoothly conduct the rescue and relief operations. While more than 2,80,000 persons were evacuated, more than 14 lakh people were brought to around 5,600 relief camps. Essentials such as food packets, clothes, bedsheets, blankets, candles, matchboxes, mosquito repellents, chlorine tablets, etc. were distributed. Medical camps were set up; essential medicines were made available. On August 18, 2018, Prime Minister Shri Narendra Modi conducted an aerial survey of the flooding situation, lauded the people for their fighting spirit and promised continued support from the Centre. He announced a financial assistance of Rs. 500 crores to the State in addition to the 100 crores announced by the Union Minister of Home Affairs. This is just advance assistance and the Centre would release additional funds once the assessment of damages is completed as per procedure. Besides, the Prime Minister also announced an ex-gratia of Rs. 2 lakhs per person to the next of kin of the deceased and Rs. 50,000 to those seriously injured from the PM’s National Relief Funds (PMNRF). Earlier, Union Home Minister Shri Rajnath Singh as well as Minister of State, Home Affairs, Shri Kiren Rijiju, had visited Kerala to review the flood. An Inter-Ministerial Centre Team (IMCT) also visited the affected areas from August 7-12 to assess the losses. 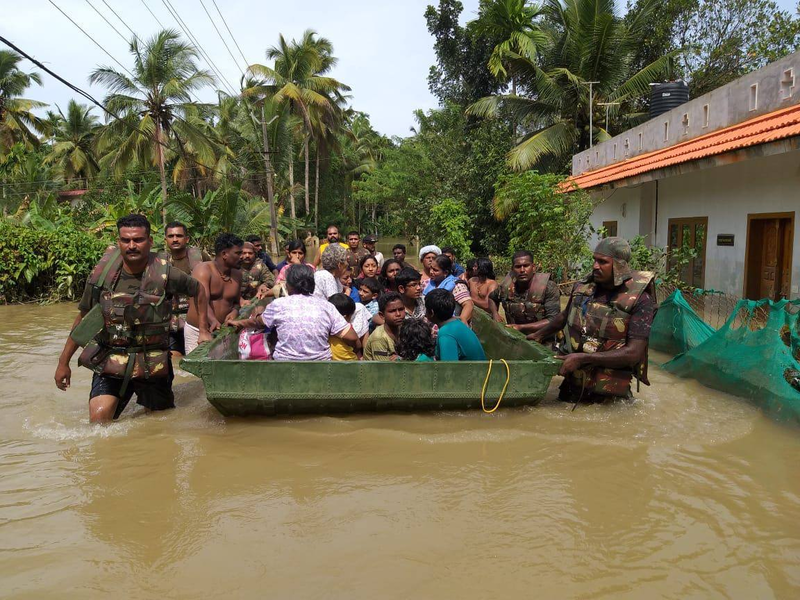 Meanwhile, on the directions of the Prime Minister, the National Crisis Management Committee (NCMC) held regular meetings beginning August 16, 2018 to take stock of the situation, preparedness, rescue and relief operations and directed that immediate and continued assistance be provided to Kerala to meet this crisis. In addition, the Centre has announced various measures such as building of damaged houses under Pradhan Mantri Awas Yojana (PMAY); additional 5.5 crore person days under Mahatma Gandhi National Rural Employment Guarantee Scheme (MGNREGS); and assistance by national agencies such as National Highways Authority of India (NHAI), NTPC and Power Grid Corporation of India Ltd. to assist the State in restoring highways and power, etc. Various State Governments also came forward to lend a helping hand to Kerala. As the rains stopped and water receded, the State witnessed a spurt in communicable diseases. Given the exigency of the circumstances, the Union Ministry of Health and Family Welfare relaxed norms to ensure that all the needed support and assistance - doctors, public health teams comprising Public Health specialists, microbiologists and an entomologists, emergency medicines, sanitary napkins, chlorine tablets, Doxycycline tablets given the increase in the number of cases of Leptospirosis - is made available. As Kerala moves beyond initial rescue and relief, the needs on the ground have changed. The quicker the State restores essential services and rebuilds itself, the quicker the people will be put on the path of recovery. Needless to add, all of us should strive to leverage this opportunity so that Kerala is built back better and the risk of losses from similar floods in the future is avoided. While applying for another PAN, you need to present a few reports as confirmation of character, evidence of location and verification of date of birth. The prerequisite and legitimacy of records vary from candidate to candidate and furthermore with the motivation behind the application. You can apply for another PAN or for redress in the current PAN or for the reissuance of PAN Card if there should be an occurrence of its misfortune or harm. You can apply new pan card here. In light of the private status of the candidate, Form 49A or Form 49AA is to be filled and submitted alongside a lot of legitimate archives. The records required for PAN card by various kinds of candidates differ according to the substance type (individual or association). You can apply new pan card here.